Cobra's armor is made of several layers that have special features. 1st layer is Phrik armor plating on the feet, shins, knees, torso, shoulders, neck, elbows, wrist and hands. 2nd layer is a black Grand Moff Imperial officer battle dress uniform laced with Armorweave. 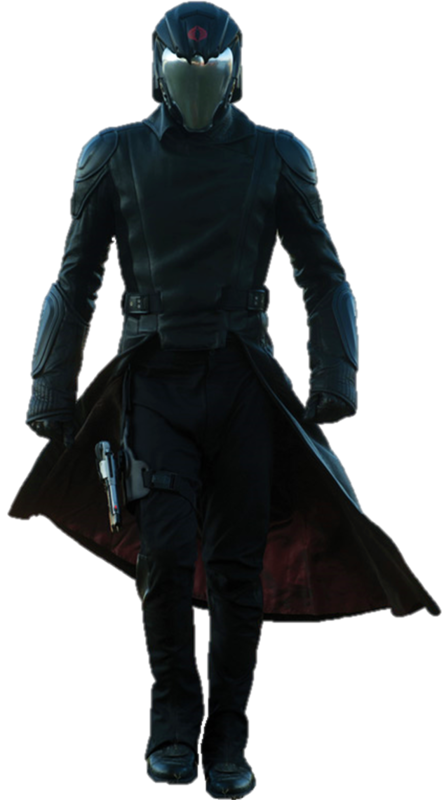 3rd layer is a long battle coat made of spacers leather and Terentatek Hide to make it nearly immune to force abilities being used on the wearer. Helmet: the helmet is made with Phrink with an inner lining of Terentatek Hide to stop force users from getting into his mind. The visor is made with a silver mirrored Glasteel, it has thermal and night vision modes, fully functional HUD system, target tracking, range finder, a respirator to filter out all toxins and gases. It also has a comlink. +Armor is immune to the force in certain areas. +wearer can see in all conditions. -Gaps in phrik plating is open for attack. -offers no protection in elemental conditions. Cobra being a former stormtrooper, shadow trooper, imperial red royal guard and an Imperial officer saw a lot of combat, fought many Jedi and Sith, he learned secrets about building armor. Therefore he built himself armor using various material that was durable and string, such as phrik which was extremely lightsaber and blaster resistant, as well as Terentatek Hide that is immune to the force on the areas that it covers. His helmet is lined with Terentatek Hide to stop force users from getting in his mind. His long battle coat was made of Terentatek Hide. He also had thermal and night vision modes, fully functional HUD system, target tracking, range finder, a respirator to filter out all toxins and gases. It also has a comlink in his helmet. Some would say Cobra's outfit was a walking nightmare to force users, and he liked it that way.